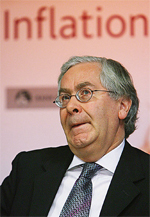 On the day the Bank of England announced that inflation is still more than double the target of 2%, Mervyn King is to be knighted. When the target has been missed for the last three years, you have to wonder what is the point of it? Whatever happened to performance related rewards?